For this week's Surname Saturday post I'd like to share an important surname in my family tree: Kephart. Kephart is the Americanized spelling of the German Gebhardt. According to various sources, the surname Kephart was first found in Silesia, where this family name dates back to at least the 9th century. The name is derived from the Old High German elements "geb," which means "gift" and "hard," meaning "brave, hardy." I rather like the sound of that. So far, in my family tree, I have gotten the Kephart line back to around 1750 in Maryland, where my 5th great grandfather, Simon Kephart was born and lived. I believe he died there too, but I haven't found the exact date information yet. That is about as far back as my mother got in her research as well (she was a genealogist too). We know that he died before January of 1801 though, because his 2nd wife, Susannah (my 5th great grandmother) died then during childbirth and was listed as a widow in her death notice. So Simon had to have died fairly near to the time of his wife's death. Now I know the original line goes back to Germany somewhere, and I will get there eventually. But my Kephart family line from Simon went from Maryland, to Ohio, with my 4th great grandfather, George Kephart. George had two children born in Maryland (including my 3rd great grandfather, Ormand, and his sister, Susan), and one child born in Allen County, Ohio (my 3rd great Uncle, Peter Kephart). I have many Kephart ancestors that were born and lived and died in Ohio--particularly in Allen County, most of them in or near Spencerville and Amanda Township. Ormand died quite young in 1856 at the age of 36 in Spencerville. He had four children in Spencerville before his death, including Catharine, George, and Oscar, and my 2nd great grandfather, Alexis Elihu Kephart; and one child, Ormand, who was born six months after his father's death. What I love about the Allen County Kephart connection is that I live only an hour from there. 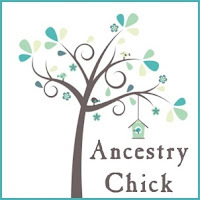 When I moved to Ohio in 1987--where my husband grew up--I had no idea of my ancestral connection, because I wasn't yet doing genealogy. So to discover this later was kind of awesome to me. It actually turns out that I have ancestors from my maternal and paternal sides of my tree that lived and/or died in Allen County, Ohio! My grandfather, Alexis married his bride, Susan Eleanor Templeton in her home state of Illinois in 1877. They lived in Spencerville, Ohio for awhile, then would eventually move to Kansas, then Iowa, before finally settling in Lincoln County, Oklahoma. They had five children, including my great grandfather, John Arthur Kephart, and his brothers Edgar and Byron, and his two sisters, Anna Carrie, and Rusha. 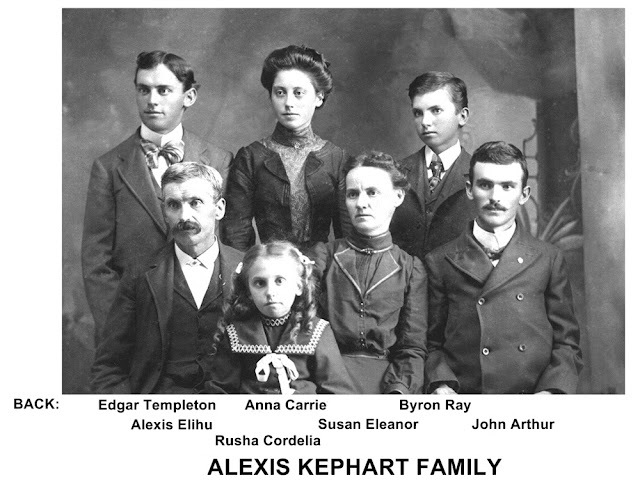 The photo below is of this Kephart family. 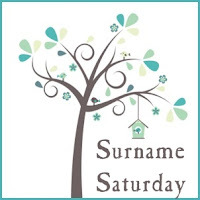 My mother was born a Kephart, her mother's maiden name, because my grandmother, Della Kephart, was unmarried at the time that my mother was born. I spent a lot of time around Kephart uncles, aunts, and cousins when I was growing up in California. A lot of the children of John Arthur ended up in California. So literally, our Kephart line ended up migrating across the entire country over time. I still have much digging to do into the Kephart family line. I have always felt very connected to this part of my family, so I love digging into my Kephart roots. I really enjoy learning anything new that I can about this branch of my family tree.